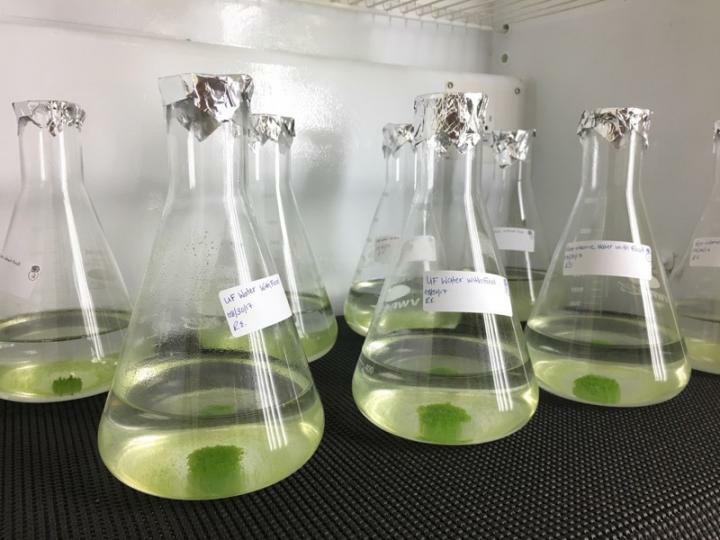 LAS VEGAS, Nev. (April 8, 2019) – A common species of freshwater green algae is capable of removing certain endocrine disrupting chemicals (EDCs) from wastewater, according to new research from the Desert Research Institute (DRI) in Las Vegas. One of the EDCs examined in the study, triclosan, disappeared completely from the ultrafiltration water after seven days, and only 38 percent remained in the ozonation water after seven days – but this happened regardless of the presence of algae, and was attributed to breakdown by photolysis (exposure to light). Bai is now working on a new study looking for antibiotic resistance in genes collected from the Las Vegas Wash, as well as a study of microplastics in the Las Vegas Wash and Lake Mead. Although Las Vegas’s treated wastewater meets Clean Water Act standards, Bai hopes that her research will draw public attention to the fact that treated wastewater is not 100 percent clean, and will also be helpful to utility managers as they develop new ways to remove untreated contaminants from wastewater prior to release. The Desert Research Institute (DRI) is a recognized world leader in basic and applied interdisciplinary research. Committed to scientific excellence and integrity, DRI faculty, students, and staff have developed scientific knowledge and innovative technologies in research projects around the globe. Since 1959, DRI’s research has advanced scientific knowledge, supported Nevada’s diversifying economy, provided science-based educational opportunities, and informed policy makers, business leaders, and community members. With campuses in Reno and Las Vegas, DRI is one of eight institutions in the Nevada System of Higher Education. Learn more at http://www.dri.edu, and connect with us on social media on Facebook, Instagram and Twitter.